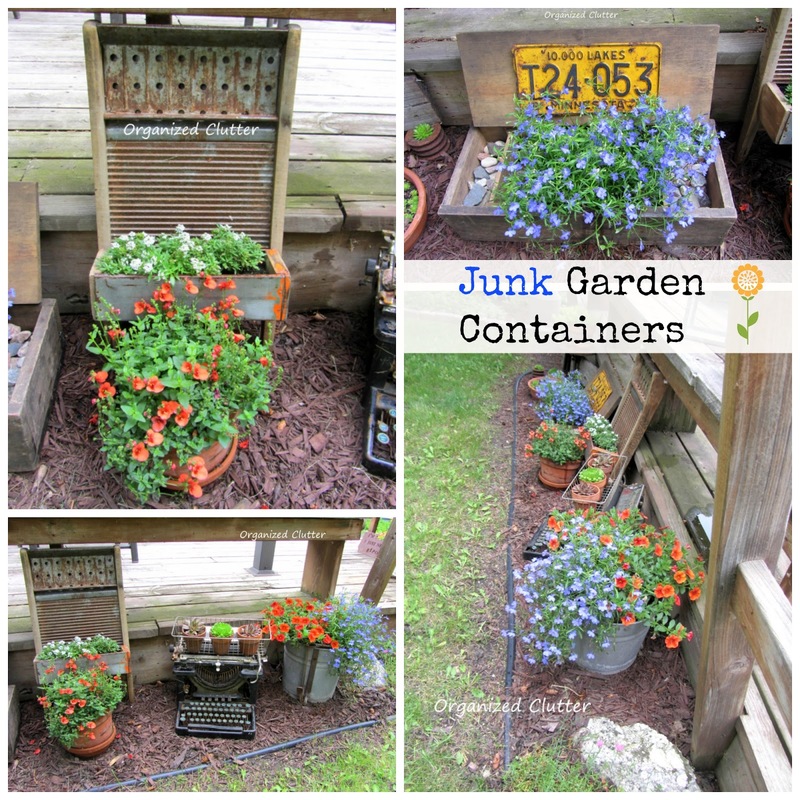 Here is a link my newly planted Junk Garden Vignette on May 22, 2014. On June 27, the old mop bucket is spilling over with blue lobelia and orange calibrachoa. The terracotta pots of succulents are multiplying in a wire basket on top of the old typewriter. The diascias like this cool weather, but the alyssum are still pretty small. I made the washboard planter in a post here. Another lobelia spills out of an old wooden crate. Here are the succulents I showed you earlier this week that I have displayed on my Grandpa's old knife sharpening contraption. There is a rose colored cranesbill in bloom at the end of the deck. 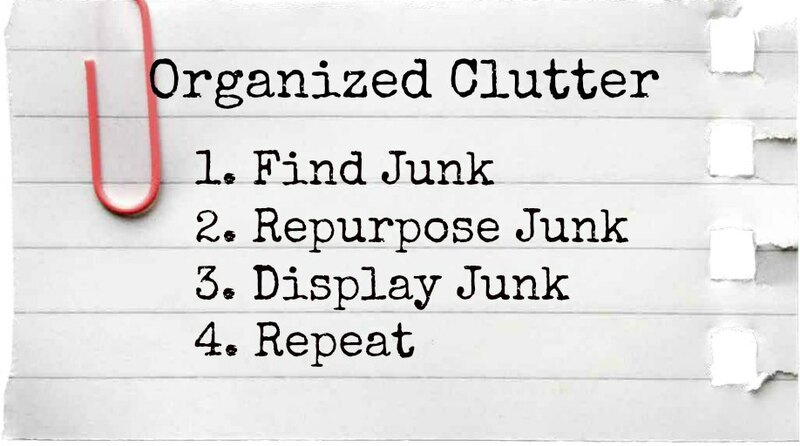 Junky planters on display June 27th! Since I found your blog off of pinterest on Wed.( which I now check everyday) I have been looking at local thrift stores and today I went to an antique store and found a funnel and some lids just because you have inspired me, I love your blog !! I love your style !! Thanks for the great ideas and sharing your passion for gardening.....Im digging it !!!!! That's great! Thanks so much! It looks great! I won't get anything like that done this year....but there's next year. Thanks for inspiring me! they certainly grab my attention! It's all looking good, especially the cranesbill. So pretty! And is that a morning glory I see already climbing your trellis? Mine are only a few inches high and I doubt they'll ever climb anything at this rate! I love your junk garden containers!! Everything looks amazing!! WOW, your containers look great - such pretty flowers. You always have such clever ideas Carlene. Thanks so much for sharing. Bet your gardens are very pretty now. Not only are your flowers gorgeous, you have the best containers for them! You're always so creative, Carlene, using wonderful vintage items. Love the typewriter idea. I got conned into buying an old manual typewriter at an auction. My 18 year old son was tagging along and thought it was sooo cool! I bought it and wondered what in the world I was going to do with it now that I have it! Love your garden. Theses days it is in the 90's which is too hot for me to get outside but I do enjoy my hanging baskets and potted plants on the patio.